Last year, Shabazz Palaces dropped not one, but two full-length records. As the duo continue their exploration of sonic sounds, they touched down at Brooklyn's Elsewhere on Monday for an eclectic set of expansive material. 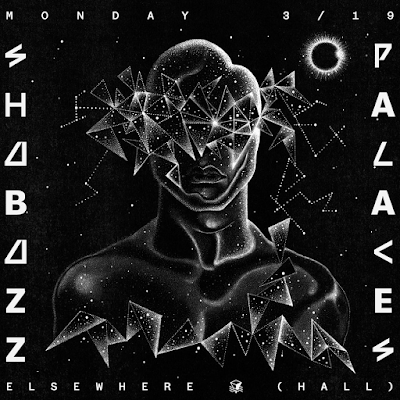 It doesn't feel like a stretch to claim that Shabazz Palaces make some of the most innovative hip-hop and their defiance of any standards propels their sound to new heights with each listen. Their rhythms are unapologetic and Ishmael's flow is unique to a degree unlike any other. It's an intergalactic sound that seems to draw from no known source of inspiration and somehow still sounds both grounded and beyond futuristic. It's an avant-garde approach to a genre that has fallen into pitfalls that ditch authenticity for fame or chart-topping hits. Shabazz takes the road, or interstellar plain, less traveled. They never rely on huge hooks, crowd-chanting choruses, or anything you're ever likely to hear on the radio. Their sound is dense and hard to crack, never succumbing to any familiar trajectory. As they came to Elsewhere, they were ready to take the crowd to their world. Balancing tribal percussions done almost exclusively live (when was the last time you heard a bongo solo at a hip-hop show?) amongst throbbing beats, the duo were in fine form as they led the crowd on an odyssey through time and space. Dynamite visuals enhanced the night and got the crowd to really come alive as the two men onstage carefully crafted their set through infectious rhymes. In the past, their show has felt a little jam-heavy and loose, never really crystalizing, but tonight they were laser focused and out to send a message. Favorites like "Forerunner Foray" and "Swerve... the reeping of all that is worthwhile (Noir not withstanding)" really got the night hyped and the group never had to rely on much interaction with the audience to really keep the night in the palms of their hands. It was refreshing to see something so experimental still met with such high regard. It was groove inducing and complex, energetic and impenetrable. It's still a sound unlike anything else and watching it go down live is mesmerizing.